Fifty word short story round-up and new prompt! It’s Sunday, and you know what that means. Time to survey the previous week’s 50-word stories, share some highlights, and launch a new prompt. I’ll start with my usual prolog. In this case, I have two things: a little something about my week and a question. I went a little off the rails this past week and wrote a series of humorous (well, in my estimation) #monomad posts. I have no idea what tickled my funny bone about black and white images, but boy did I have fun with it, sharing weird insights into my childhood and so on. I should perhaps apologize to the serious monomads. It’s a fun challenge, and actual skilled photographers contribute an amazing collection of images. I love creative challenges, and this one is worth checking out. If you want to see my humble efforts (and the silly accompanying content), here they are: Monday macro, Tuesday street, Wednesday abstract, Thursday animals, and Friday flowers. I have a question for you. Many of us have posts we wish got a little more exposure, a little more love. I’m thinking of starting a project that helps with that. It would be a weekly post that encourages people to share their favorite underloved post of the past week, whether it’s their own or someone else’s. What do you think? Will I just open myself up to spam and those who self-promote distastefully? Or would it be a fun way for people to curate the best content and discover content you may have missed? If you’re new here, welcome! This is a weekly challenge that kicks off on Sundays with a one-word prompt. Participants use the prompt to create a micro-fiction story in just 50 words. For more info and inspiration, check out the recent post about this project, Fifty-word challenge: FAQs, ideas, motivation and showcase. This is a continuation of the #fiftywords challenge started by @miniature-tiger who has been developing a seafaring strategy game called Archipelago for the Utopian.io open source community. Visit the linked post for the latest update. Last week's prompt was “bank” and the #fiftywords community developed stories involving financial institutions, snow banks, banking planes, river banks, and even sperm banks. As always, I've chosen some highlights of the week -- stories that were well written and impactful, and that transport us into a moment, a place, a life. It was another great week of wonderful submissions, and lots of great mutual support. I love to see everyone reading and commenting on one another’s stories! This story is just a hoot. I'd taken this job to rob the bank. I scoped, working the reception desk, signing men in and directing them into the private rooms. He took four months to show up. I knew as soon as he came in he was the one. He smiled. I prepared the turkey baster. A sad day for the exploring youth…. "It's like a tunnel!" Petey clawed his way into the underbrush overgrowing the bank. "Come on! It's a real tunnel under here!" I listened for Petey, but he was gone. Taken by the bank, forever lost. This one is so poignant and sad, and so well done. The last few sat in a pot atop the woodstove, barely boiling. Banking the embers, I pulled my children close. The icy fist of the wind rattled the windows, the drafts like knives. I wrapped the blanket around them as best I could. I waited for the end. This sad and amazing story makes my head spin. Did the author just make me care about a criminal? And what all is happening here? We want more, Anike! The plan was perfect, so why am I crying? These people were unprepared and unarmed. It should’ve been simple—no casualties. As my marooned soul pours from my chest, I stare at the bank’s ceiling before the darkness comes. This is always how it ends, loop after loop. It’s cold. Maybe it’s not too late to run for cover? With a lazy bank, the dragon turned back over the army, opening its toothy maw. Slow flaps of massive wings gusted wind, sent banners to snapping and dust to rising. Fear spread in the hearts of mortal men as they comprehended the fiery death about to rain down on them. Well, we do have one more story involving a financial institution… and an evil one at that. Mike Tanslin of Nexicorp spoke to the press. "We let the world have a go at it," he said. "Fifty-million dollars. Cash. Middle of New York. Unbreakable vault." Cameras flashed. Mike's perfect teeth were a skeleton's smile. The prompt for this week is “change.” I hope you have some fun with this, Fifty Worders! Please review carefully. Images must not be pulled from any Internet site. Use only artwork that you have the right to use, and attribute it properly. See the “Proper use of images” topic below. And speaking of #thewritersblock, if you would like editing help for your stories before posting them, follow the tag to find them on Discord. Deadline for this week: Saturday, May 26th. Thanks so much for reading. As always, your upvote, comment and resteem support is greatly appreciated! I'm glad I took part this week, Now the next one is "Change" right? it's too vague, too Awesome!! Will I just open myself up to spam and those who self-promote distastefully? Or would it be a fun way for people to curate the best content and discover content you may have missed? The thing is there will always be people who'll try to abuse these types of posts, that's why it needs someone strong (better yet, two strong people or more) to manage these posts. One way I imagine make a list post that you update everyday, it should have a set quality standard, and when receiving comments of steemians under-voted posts in comments on that list. Each day put the posts that are at least that quality, then put them in the updated list. But as I said, this needs a strong person to manage it... Better if more. Thank you so much for your thoughts! One aspect that I neglected to mention is that I can only start projects that require limited intervention, as my schedule is too busy. So a daily project or one that requires a lot of monitoring and intervention isn’t tenable. I will think about it some more, but that level of effort is unfortunately not an option for me. I said we need strong people to manage that because most of those who can, are already busy doing things that might be more productive. So I see your situation. I can only start projects that require limited intervention, as my schedule is too busy. So a daily project or one that requires a lot of monitoring and intervention isn’t tenable. Also loving that idea of underappreciated authors as well. All I think I need to see is a categorical way to establish consistency. Otherwise, it’ll be refined later, let’s see it in action first. Another week down, and now blows the winds of change. Ha! Story half done already! Thanks for the ongoing challenge, @jayna! Regarding the Thing 2 (promoting underloved posts), what format/workflow are you envisioning? Would it essentially be a link-drop as a comment into a post where you suggest/allow people to do that? I'd probably be leery of spam, but maybe if people offered a brief synopsis? (wooo...of 50 words?) along with their link it would at least be a bit more than just a dump and run? To let everyone be the judge of their own best effort of the week. Encourage community support and give participants access to content they may not otherwise see. Perhaps even create a go-to place for curation pros to find great work. I know there are many different ways to achieve this. It would be another way to (hopefully) help quality content rise above the crud. Thoughts? Worth a trial? I think it's worth a trial. Spammers would be inevitable, either way you go at it because, frankly, they don't read. Flagging to hide would remedy that, and I'll help with that, get some community cleaning in, haha. The blurb idea is great. Not only tickles interest but shows the user's investment in their content and that they're not a spammer. I like the idea of letting the community market for curation. It gets involvement in from both content creators and curators, and may just become a go-to for curation purposes. With the blurbs, curators could ask to use them for curation posts, and I'm sure that alleviates some of the pressure of curating. Maybe give a template structure for people to use in their comments. Something like Title, username, genre, word count, blurb. As an example. Also perhaps a follow-up post of the top curated posts using that info mid-week, with their permission, or a curation post of the one you enjoyed or something? Those are some excellent thoughts, @anikekirsten! I love the template idea. The structure would help contributors and further encourage them to share their quality work thoughtfully, instead if just dropping links. Thank you! The story is about Ramadan, it's below if you want to read it now, but in the post I talk about the motivation behind the story and other interesting things. The sun sets, signaling the time for the breakfast. At the restored familial bond, Mother smiles. "I wish it's like this everyday." Father retorts. "But this makes Ramadan special. Everything changes in it." Brother eats my dates. "Even the food becomes better." I take his instead. "It's a welcome change." If you're asking how one eat dates, it's a fruit... Palm date is one of the iconic fruits of the arab/islamic world. Wow such amazing stories..I feel terrible for not participating this week. Started a new job on Monday and I’ve been swamped..90+ hours. Congratulations on your new job. You are a doctor, correct? Well, it's very understandable that you didn't have time to write a post last week while working so many hours! Love this @jayna, and I have decided to take part! The word limit makes it fun and easy to paticipate. I'm so glad you jumped in! Welcome, @foxyspirit. Yes, that is absolutely true. It's hard to do! I love being challenged by the goal to hit exactly 50 words. I hope you enjoy it too. Time to hop back onto the 50 word story wagon! Also, I think a curation/promotion weekly post would be cool but I would suggest having certain criteria to submit to filter out too many posts (ie. has to fall under a certain $ amount and has to be in the realm of fiction/music/whatever categories you decide). Thank you for the feedback, @cizzo. I am realizing that it may just be another of my clever yet sadly misguided ideas. I fear there are more ways it can go wrong and get too complicated (particularly on the management end) than there are ways it can go right. Okay I hope I'm not too late... Had a Change of mind. This is my first time... My Entry. Dropping my submission here. Thanks! Your story sounds really personal. I Likkie though. Hooray, another victim! Er, I mean participant. Welcome, @aggroed. Thanks for sharing your humor. I had no idea frog eggs looked like that! I had to go look it up. I thought your fabulous imagination got the best of you at last. But it is in fact true! 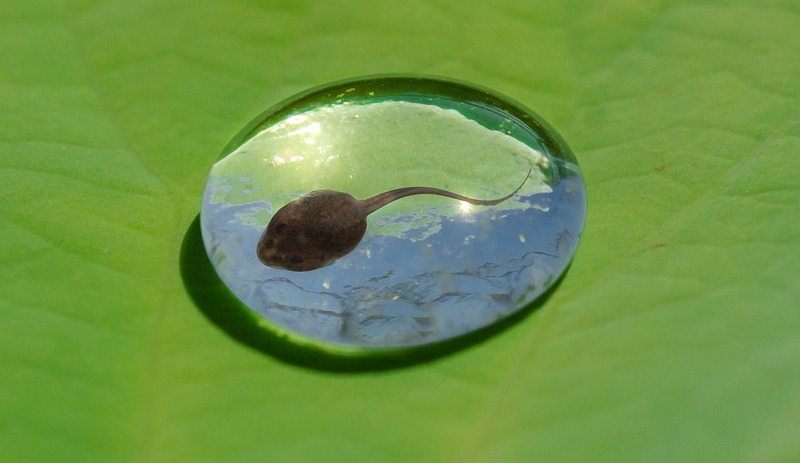 There are some great pictures of tadpoles on the Internet, including images like the one you included in your post, and those that look like a whole bunch of eyeballs! The process is really cool, and lots of primary schools here in Ireland do it with the kids where they have frogspawn, and watch it going through the different stages of tadpole, froglet and finally frog.. Thanks for joining the fifty word challenge! Let's travel to the 18th century! Thank you for the fifty word story promotion. I heard about this from eaglespirit. Here's my entry to the fifty word story contest . Hope you like it. My entry is Going Through changes this week. :p ahhh, this is so addictive! Oh my gosh, I am so charmed! I’m sorry if I missed a mention. Life is indeed busy! Is there a timeline or time limit for when you take part once nominated? Fun! Thank you! I am honored that you thought of me. I have been at a conference for a few days and am trying to catch my breath, but if there isn’t a specific timeline, I will plan on it as soon as I catch up! Hi. can I still participate? Yes, absolutely. You have until end of Saturday (central time).